ever since I switched over to sulfate free shampoos, I finally have NO frizz in my curls. You are right, your hair always looks amazing! Gorgeous curls. I stopped brushing my hair whenever I remember not to do it. It looks much better when I wash it in the morning than when I wash it at night and sleep on it. My biggest struggle is what to do with the hair on day 2 and 3 and 4 since I don’t like to wash it daily (even with just conditioner).I found a cream that I like and use exclusively now, but can’t think of the name at the moment. You’re right….this is revelatory advice. I’ve always thought your hair was AMAZING…but those photos. Wow. I’m buying this Jessicurl business. I am pleased and amused to see that the technique I landed on by myself over the years is the recomended approach for curly hair (generally). I can’t stress the importance of not shampooing everyday and of NOT touching your hair until it is dry. I don’t use the t-shirt, just a quick upside down wrap with a towel, but it sounds like it amounts to nearly the same thing. I guess the t-shirt leaves you with slightly less wet hair when you leave the house, which is the one downside of curly hair unless you’re a morning person. I will add some people say you should only ever finger comb curly hair, but I use a wide toothed comb once with conditioner and once more when my hair is sopping wet and hasn’t been dried yet–to part it and get it a bit off of my scalp–and it works well. Also, a good leave-in conditioner when my hair is still sopping wet and then a finishing cream (I like Kiehl’s silk and groom) once I’ve toweled it off work for me. Two words: sock bun. I have very long curly hair, which I let air dry until slightly damp and then I roll it up in a sock bun overnight. 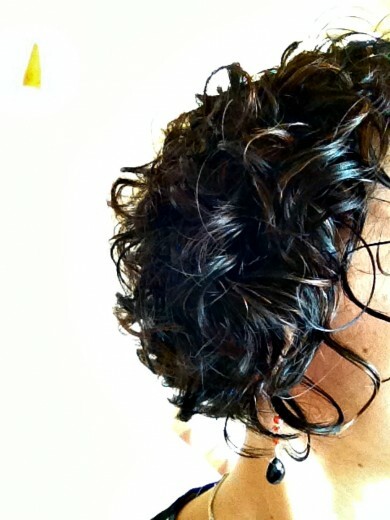 It controlls my curls and I put in a touch of moroccan oil or aloe vera gel as my product. Lemon grass oil also works well, especially in the summer since it is also a natural insect repellent. 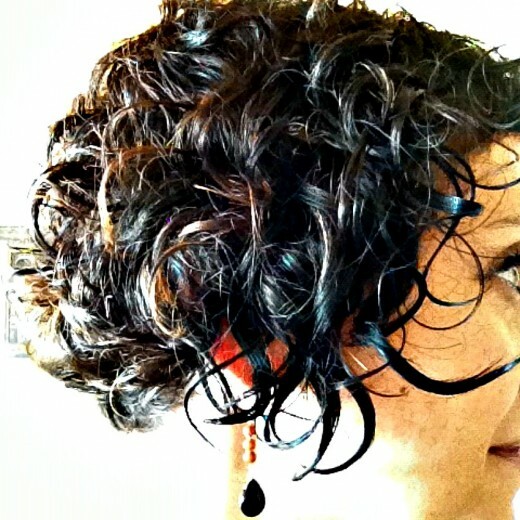 Can you talk a little about your cut, such as layering lengths, etc. I have medium curly hair and my hairdresser leaves it kind of long on top and blows it smooth on top. It looks great when she styles but it sometimes looks “bozo-ish” when I do. Kim, I’m not sure I can speak directly to cut. I’ve been lucky in that I’ve seen people who “get” my hair. But if you feel like your cut is not working with your hair type, I would seek out a person who cuts it dry. That way, they can really see what it does when it is dry rather than wet and well behaved. :) For the record. My hair is currently in kind of bob with longer front and shorter back. I do have a lot of layers. Thanks Dana! I have been using my hairdresser for about 8 years and she does a really great job. The last few years (I’m 52), my hair has really gotten curly. I’m thinking a lot of layers might be the answer. I love your hair, in fact, when I first started following your blog(about a year ago), I noticed it right away and loved it. It appears you have shorter layers on top where mine are longer. I also have a bob, shorter in back and longer in front. I had her cut it shorter a couple of weeks and live it but think I also want it shorter on top. 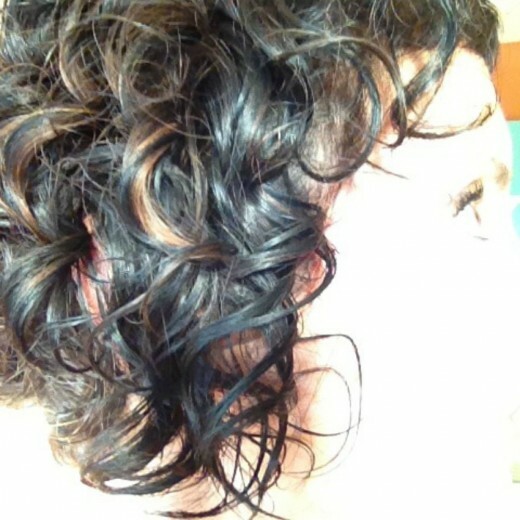 I have curly hair.but it does not grow longer.it’s medium curl.can u help me with growing it longer please? Coz i luv long curls. from another curly over here, I have a good stylist in sf if you need one, otherwise I am really into the Bamboo Anti Frizz line by Alterna for shampoo and conditioner, they sell it at Sephora as well to make life easier. like the plopping tip, im going to have to try that one! 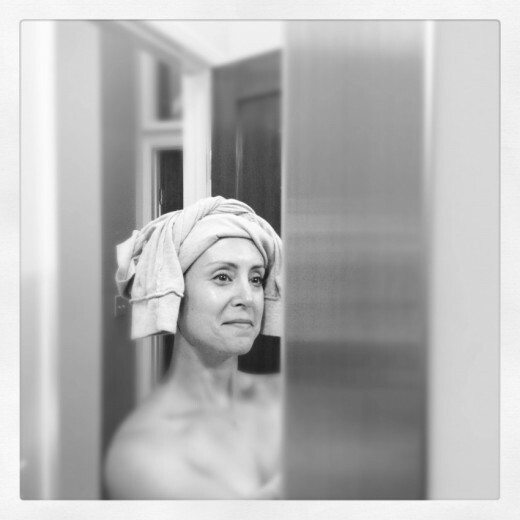 SO happy to see this post and read about your epiphany! I have thick, curly, frizzy hair and sometimes the only way to tame it is to flat iron! Love the sulfate-free suggestion. What helps me is massaging my hair with warm coconut oil and letting it sit for 45 mins before washing. It really conditions the curls. FOrgive me to intrude, my hair is not curly, but it is wavy – and the best tip I ever got agrees with one of yours: do not wash it every day. I use only very hot water on the “non-washing days” and it is amazing how much smoother and pliable my hair is, just from skipping the shampoo. I read a book about 9 years ago…don’t wash curly hair. also helps if you a have a problem with thinning hair. smells GREAT and changes the texture of my hair immediately. What a fabulously useful post! I think the most important one is having a button on each page and below each post.Thanks for sharing.